After engine failure denied me any points from Singapore (where I looked set to win, dammit! ), I was level on points once more with Button, and Webber had closed to 7 points. With three races to go, the title battle was still a three-way affair. 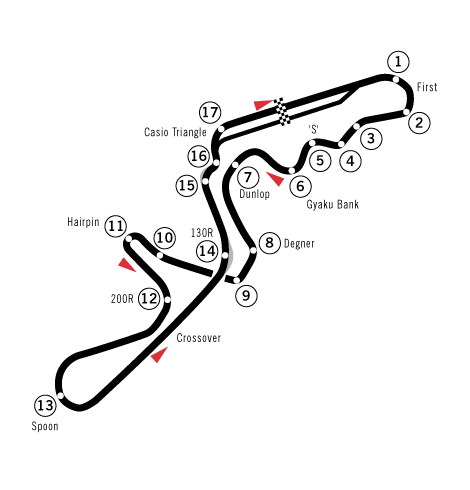 Suzuka (the only figure-8 circuit in F1) is a famous track, having decided many a title battle, sometimes in controversial fashion. It was here in 1989 that Senna and Prost came together at a chicane, and Senna was able to restart his car and win, only to be disqualified for missing the chicane as he rejoined the track. Senna was furious, and his anger would return in 1990, at the same venue, when, despite qualifying on pole, it would be title rival Prost who would (starting from second) have the cleaner, grippier side of the track. Senna was adamant that Prost would not get away from him, and as Prost did indeed move past him at the start, Senna refused to yield the first corner, and the two collided again – only this time, Senna was champion. But enough history lessons! What about my race? In practice I dominated. Even on hard tyres I was faster than everyone else and on soft tyres, over a second quicker. This pace, on a track with several fast curves, was once again the result of being aggressive at these corners when the AI-controlled cars were conservative. The opening sequence of fast right and left turns took a few goes to get right, but once mastered, I was able to go into qualifying full of confidence. Qualifying was pretty easy and I was on pole once more, only to my surprise, Nico Rosberg in an underperforming Williams was second, and Button was third. At the start I covered Button off and Rosberg drew alongside me but I held my line and kept ahead through the fast set of opening corners. From that point on, I eased to the win. I easily outpaced everyone, lapping all save Rosberg (whose 2nd place was a shock). Button could only finish 9th, thus scoring no points, meaning should I finish ahead of him and Webber, I will be champion in Brazil.